The U.S. government is offering an unprecedented $10 million reward to capture the leader of the Jalisco New Generation Cartel. Nemesio Ruben Oseguera Cervantes, 52, is known as “El Mencho.” He is a fugitive and was designated as a “Kingpin” under the Foreign Narcotics Kingpin Designation Act by the Department of the Treasury in April 2015. The reward for Oseguera Cervantes’s arrest is the highest the government offers for narcotics fugitives. 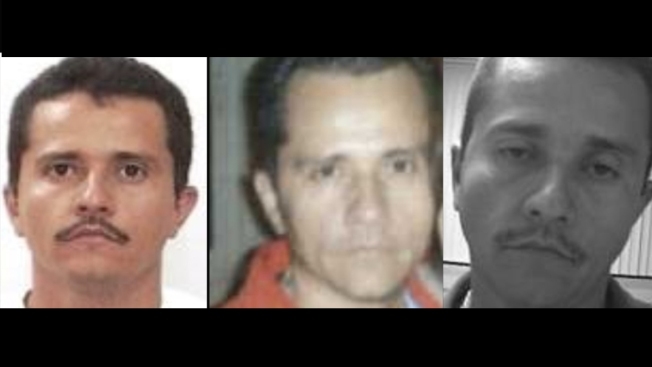 His son, known as “Menchito,” is in custody in Mexico and awaiting extradition to the U.S.
Another high ranking CJNG member, Erick Valencia Salazar, aka, “El 85,” is wanted with a reward offered in the amount of $5 million. CJNG is believed to be influential in 75 percent of the states in Mexico, according to the U.S. Department of Justice. The cartel once shot down a Mexican military helicopter with a rocket launcher. The group's primary product is methamphetamine, with main U.S. distribution hubs in Los Angeles, New York and Atlanta. "El Mencho" is considered one of the most powerful drug traffickers in the world, who experts say is partly responsible for the violence that exists in Tijuana. "Tijuana is the cherry on the cake, it's a very coveted place," said Victor Clark, an anthropologist. In August, U.S. Drug Enforcement Administration officials unveiled additional strategies in combating Mexican drug cartels with the Mexican government, military and federal police. The new plans include putting greater emphasis on attacking cartels' financial infrastructure and calling for a new enforcement group based in Chicago that will concentrate on international investigations of cartels. A 2018 report by the University of San Diego's Justice in Mexico said Guzman's takedown "dramatically reshaped the landscape of Mexican organized crime," including by clearing the way for the rise of CJNG. It added the cartel's 52-year-old leader "has a reputation as a ruthless killer." He migrated to the U.S. in the 1980s and was deported back to Mexico after a trafficking conviction.